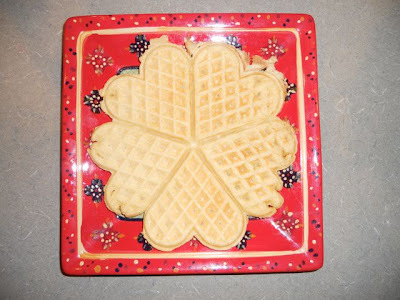 Good Friday morning JoAnna decided that we should have waffles for breakfast. Here she mixes her eggs and milk. 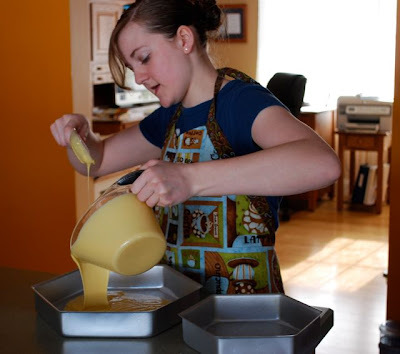 She pours the melted butter into the milk and eggs. 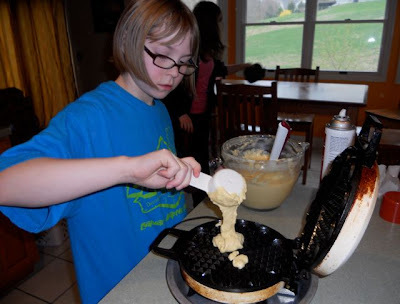 JoAnna pours her waffle batter onto the waffle maker. 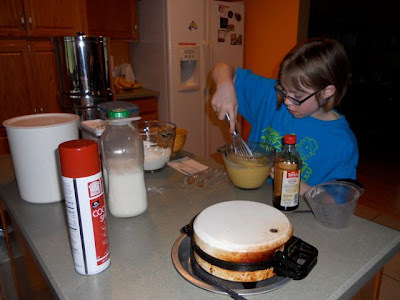 JoAnna checks on her waffles - making sure the batter doesn't leak out. Here is the finished product. Homemade strawberry syrup made them even better. Yummy!! 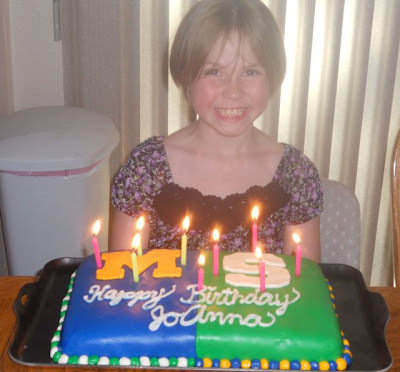 Great job, JoAnna. 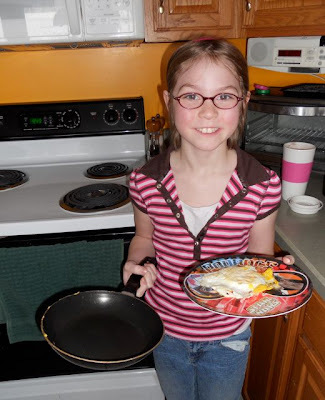 You are learning skills that will make you a wonderful wife and mommy some day. Creativity is Lydia's middle name. Her hands are always working and doing something. Her piano skills top the list of finger abilities. Last summer my mom taught her how to quilt and she came home and made a quilt all by herself. She makes cards. She loves to work in the kitchen. 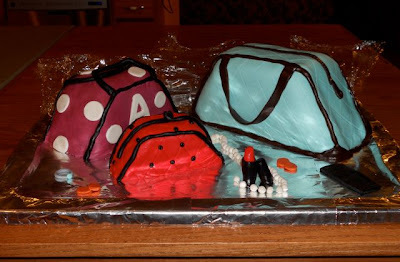 She has recently taken an interest in cake decorating. 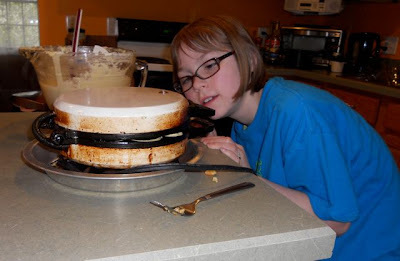 Lydia making a cake for a friend's birthday. 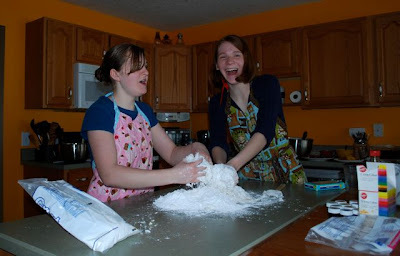 Lydia and her friend, Meredith, making the marshmallow fondant for the cake. 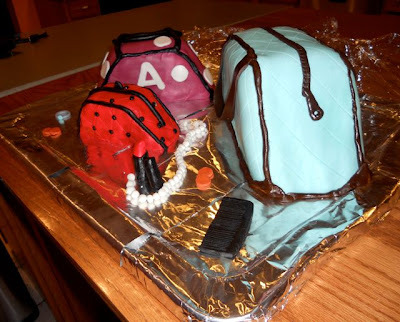 The finished purse cakes for Amanda's birthday. A second view of the finished cakes. 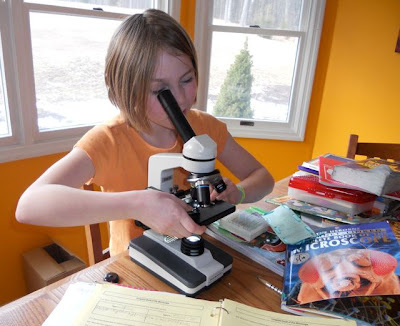 JoAnna has recently discovered our microscope. The one we bought came with a case of pre-made slides. Last week we enjoyed examining each of the slides. We talked about how amazing God is and how marvelous is His creation. JoAnna exploring some tiny little "pieces" of God's creation. The children tried to get me to give them President's Day off. After they had worked all morning I told them that they could play a game this afternoon. 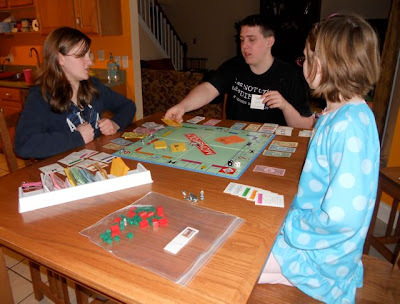 They settled on Monopoly. They are out there now, talking and I think they are even teaching JoAnna something about buying and selling property. 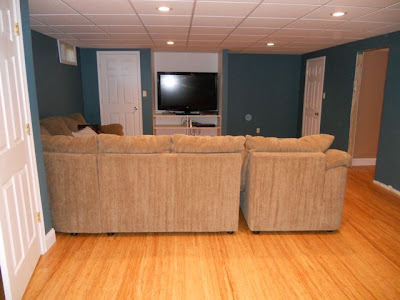 When we moved into our house last year we had visions of finishing the basement to give us a place to hang out. In August that dream came to fruition. Here is the basement finished and ready to use - with the exception of the door to the laundry room to the far right (it was on order). 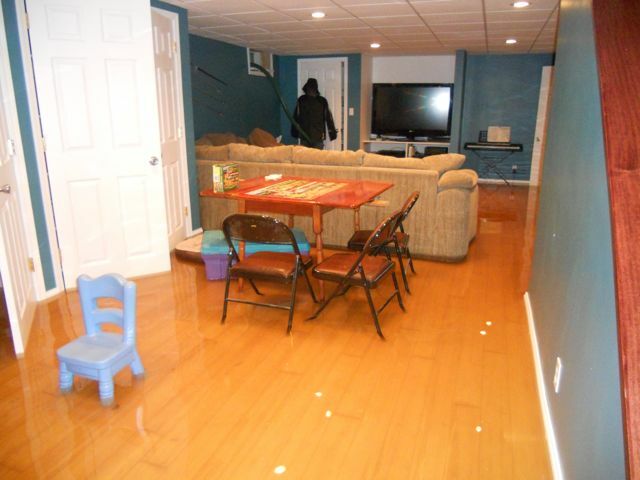 We went to my parents house for Thanksgiving and this is what we came home to...4 inches of water in the basement. The water came to the top of the baseboards, so this is with some of the water already removed. I was sick to my stomach when I saw my beautiful bamboo floor under water. The only thing that upset me more were the photo albums on the bottom shelf of the book shelf. One of the albums submerged was my wedding album. Thankfully, I was able to salvage all of the pictures. Our home fellowship group came and bailed water and ripped out the bottom of the dry wall. Here is the flooring as the children and I pulled it up and numbered it. 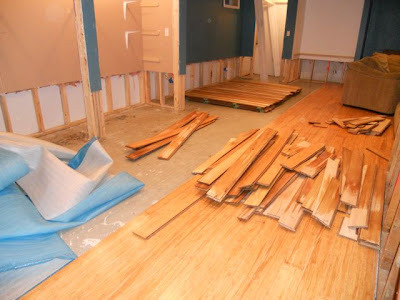 I think we were able to save the flooring. I now have a brand new sump pump in my storage room (the lowest point of the basement). We look forward to putting things back together and getting our "hang out space" back. 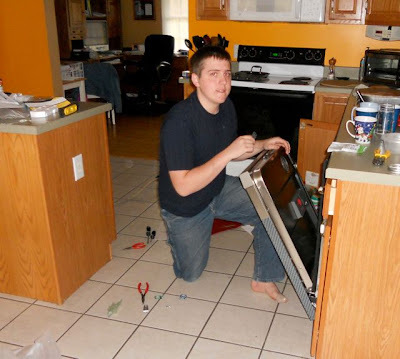 In the fall my dish washer decided to stop cleaning. It still worked, but several parts had fallen off and the dishes actually came out dirtier than they went in. I ended up purchasing a new one and Caleb saved the installation fees by installing it for me. In early January a family at church needed help watching their grandson. Little Bryan was only a few days old. 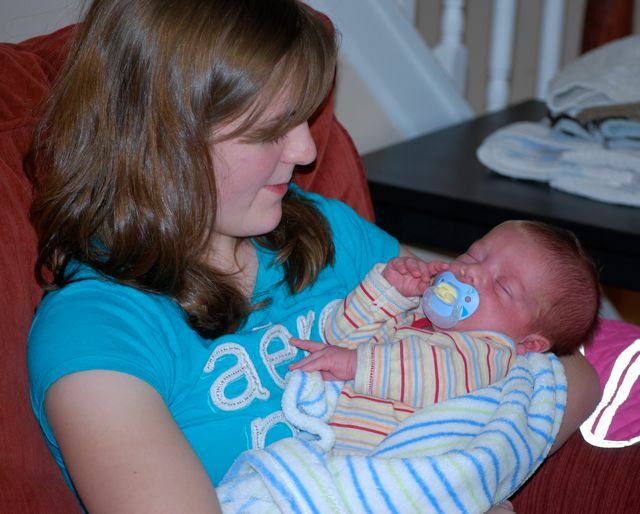 Lydia even tried her hand at holding this sweet bundle of boy. JoAnna loves science experiments. 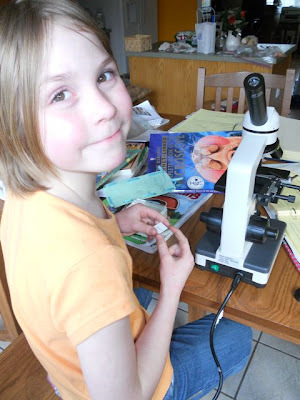 She has been doing a series of experiments focused on teaching her about magnetic fields. In this one she had to hang as many paper clips as possible in the bent clip. 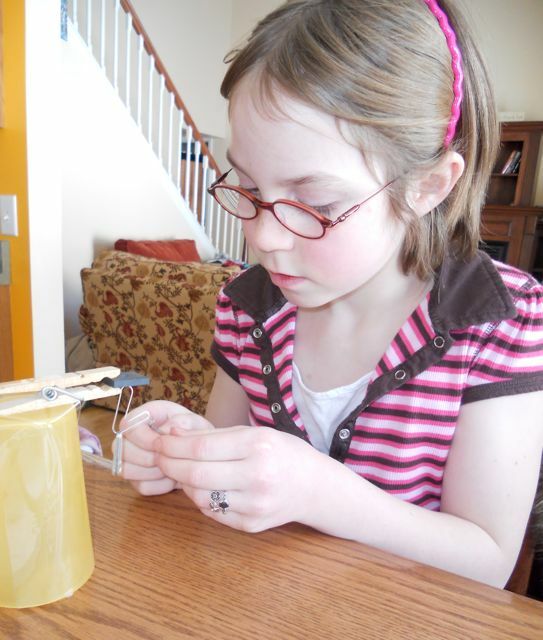 As we put layers of tape on the magnet the bent clip held fewer and fewer paper clips. Most every morning JoAnna can be found in the kitchen getting her own breakfast. 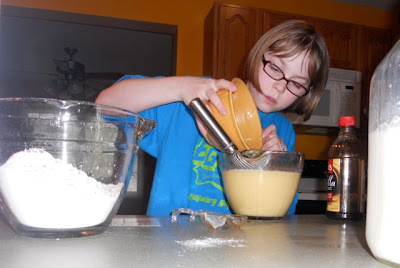 For this budding chef cereal is too easy...she has to make oat bran or eggs. Today marks Chris' 4th year in the presence of his Lord and Savior. I still miss him greatly, but I can honestly rejoice with him...he is WITH JESUS!!!! Here is the link to the slide show video that I made last year in his memory. I also added a few random pictures. 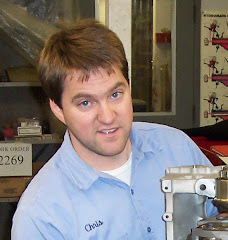 Up to this point in his time at MMS Chris had had several opportunities to get engine experience. This photo (and the one below) were taken in Bolivia. When the team had come together to reassemble the aircraft they were asked, "Who wants to work on the engine?" No one responded so Chris piped up, "I've had experience in this area and I am willing to over see the installation of the engine." Chris being silly. Gabriel watches his antics. Chris in front of MAF's 206 - the one Ian's team rebuilt. The summer before Chris died we dug up around the house to seal the basement. While Chris and Caleb were taking up these paving stones they found an ant colony, complete with eggs and a queen. It actually extended the length of several of the stones. 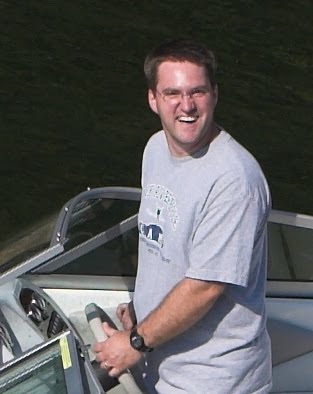 The week before his brain tumor was found we were taken on a house boat vacation. He was taking the speed boat out for a pleasure ride and before he took it in to the dock he stopped along side the house boat. Marla captured the most precious smile on Chris' face. My mom loves it b/c she thinks he looks like he's asking, "Can I have one?" 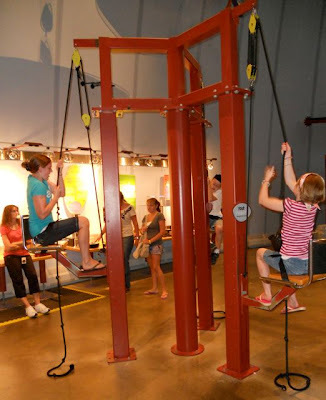 Yesterday we went, with friends and fellow home schoolers, to the Cosi museum in Columbus. We went through the Titanic exhibit and found it fascinating. When you enter the exhibit you receive a ticket. 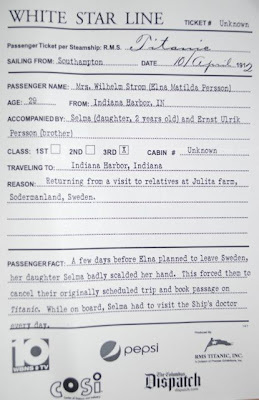 On one side is your "Boarding Pass" and the other side is the name of a person who actually boarding the Titanic, along with a description of why they were on the ill fated ship. We were told that at the end of the exhibit we would find a memorial wall listing all of the people and whether they lived or perished. We were not allowed to take pictures while in the exhibit, I wish could share the snapshots in my mind. It amazed me that the wood had all rotted away, but they found papers, books and money still in tact and able to be read. It was truly amazing stepping back in time and experiencing a part of history. I was most struck with the sovereignty of God. Many people were not even supposed to be in the ship, but, for one reason or another, they were and they perished. God knows our days and He IS in control of every one of them. 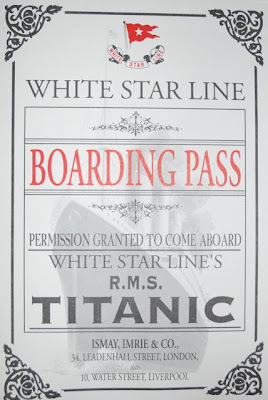 Boarding Pass to get on the Titanic - actually just to get into the exhibit. Mrs. Wilhelm Strom, Dana, perished along with her 2 year old daughter. 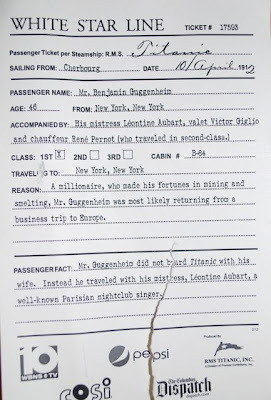 Mr. Benjamin Guggenheim, Caleb, perished, but his French mistress survived. 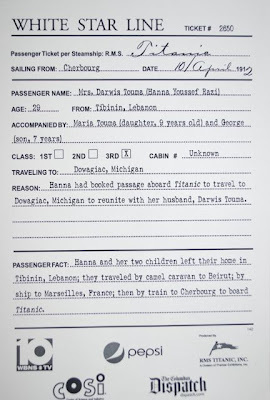 Mrs. Darwis Touma, Lydia, along with her two children were saved. 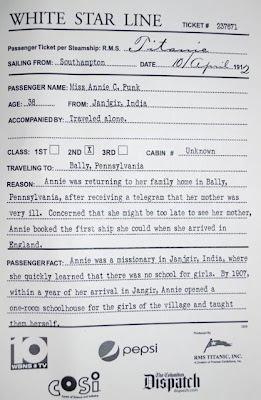 Miss Annie C. Funk, JoAnna, perished. 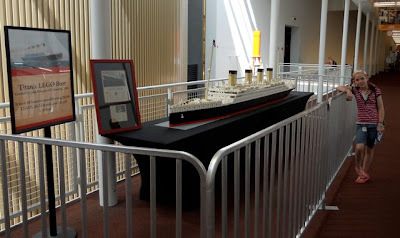 JoAnna next to a Lego model of the the Titanic. After the Titanic we ate lunch on the lawn. 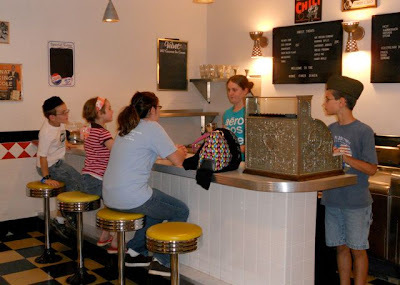 After lunch we reentered the museum and the kids had fun. Here are pictures. 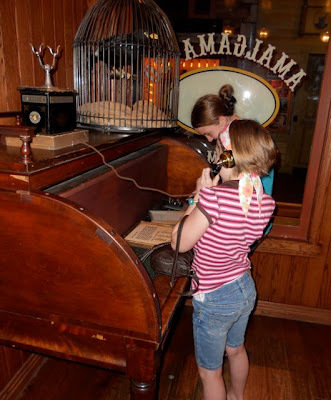 JoAnna on the phone and Lydia sending a telegraph. JoAnna operating the switch board. 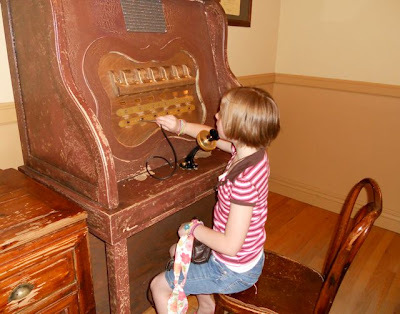 I don't know why, but this reminds me of the Little House on the Prairie episode where Mrs. Oleson puts in a switchboard and then eavesdrops on the phone calls. 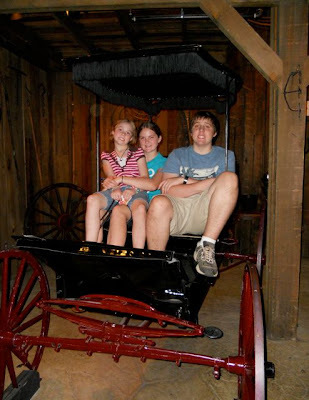 JoAnna, Lydia and Caleb "stepping out" in their buggy. Brian, JoAnna and Kelly waiting for Lydia to get them ice cream. Michael prepares to take their money. 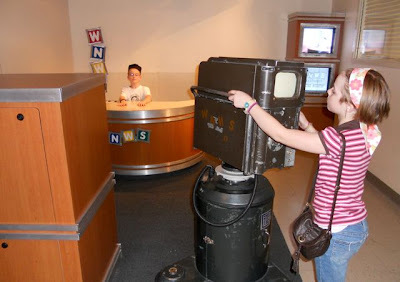 Brian, the TV newsman, ready to give a special update, while JoAnna, his camera girl, films his report. 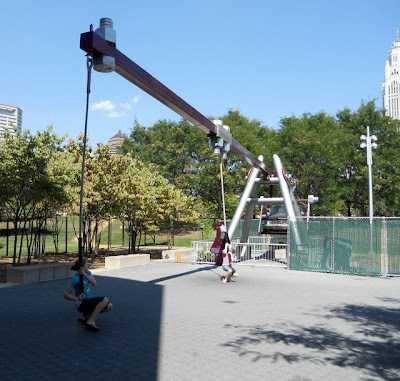 Lydia, Brian and JoAnna learn the importance of using pulleys to help do their work. Lydia and JoAnna using a lever to lift this car. We spent a few days camping with friends from church. 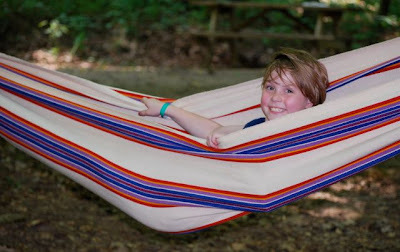 We went to see the outside of a castle, mini-golfed, swam, walked, cooked out, tubed down the Mohican river. Caleb, Lydia & JoAnna, outside the castle. JoAnna doing what we enjoyed the most while camping...relaxing. Several years ago Chris brought this hammock home from Bolivia. Lydia spent 1 1/2 weeks in Michigan at my parents house. My mom taught her how to quilt. One of the best things Lydia was able to do is spend time with her little cousins. By the time we arrived Logan (6) and Brendon (3) were very much "in love" with their cousin Lydia. 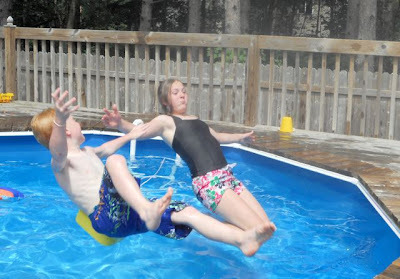 Logan and Lydia falling backward into the pool. I'm not sure how it happened, but I now have a son who is 16 and legally able to drive. We have decided that he won't take driving lessons until next summer. He is carrying a large load in school this year. 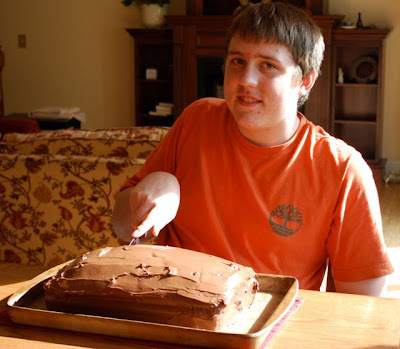 He is a sophomore and at the end of this year he will have 16 of the 21 necessary credits to graduate. One morning I found JoAnna and Tessa sitting in the front yard. 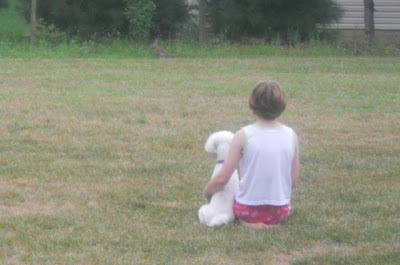 JoAnna informed me that they were watching a bunny. Sweet. I have never canned before, but for some reason this summer I have been driven to try. 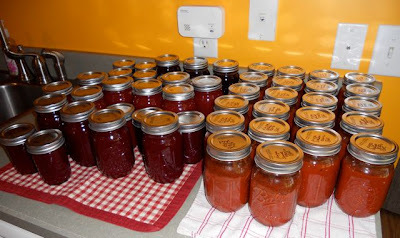 So far, I have canned 22 pints of pizza sauce, 5 pints of blackberry syrup, 6 pints of red raspberry syrup and 11 pints of strawberry syrup. I have also froze 30 pounds of blueberries, 6 dozen ears of corn and 1/2 bushel of peaches. I am also going to share in the purchasing of a cow...I will get 1/4 of it. Christopher Jon Abernethy grew up on Whidbey Island in Washington. He was the youngest of 7. At the age of 7 he asked Jesus Christ to be his Savior. While he was in high school he felt the Lord leading him into mission aviation. 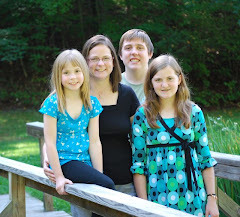 After high school he boarded a plane and headed to the Moody Bible Institute. While there he met his future wife (Dana--me) and the Lord redirected his path--just a little. After several long years of waiting Chris finally made it to MMS Aviation where he acheived his goal of being an airplane mechanic. His mission service, here on this earth, was not meant to be for long. 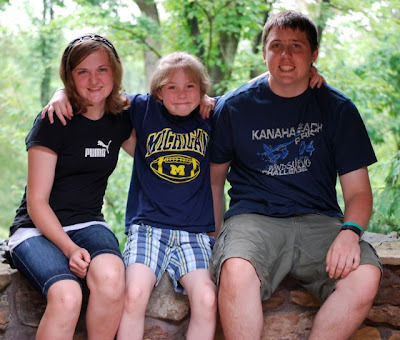 On September 15, 2006 Chris was diagnosed with a brain tumor. After only 35 days he was called to stand in the presence of his Savior. His legacy of following Jesus still lives on in his children and those of us who are left to carry on.